These mushroom drawings are so nice and easy to copy if you are just starting to draw. After all, I created these drawings when I wasn't feeling entirely confident so if I can do it, I'm pretty sure you can, too! We tell ourselves we can't do certain things but if we put in the effort, anything is possible. It is an amazing feeling when you prove yourself wrong! If you are about to start teaching yourself to draw, the simple line of these images is the style to look for when you flip through magazines or books for reference pictures. This mushroom outline is a good example to use if you want to illustrate a cartoon style or even for fantasy drawings. It is an umbrella shaped fungi which consists of a stalk with a rounded cap. There are more than 3,000 species in the world with more than 2,000 being non-poisonous and safe to eat. The remainder are poisonous or taste terrible. This is a drawing of common mushrooms that are too small to be of any use in cooking. There is a lot of variety in size and color of this natural fungus growth. The poisonous ones are commonly called toadstools. Most mushrooms have gills, like thin walls, under the cap and others have tubes. Some of them have a veil that grows over the gills or tubes and this veil tears as it gets bigger. It's the veil that you can see sometimes, when it's still attached to the stalk. The image on the left is a drawing of table mushrooms that we normally buy for creative cooking. When you practice copying these mushroom drawings, you come to know the main parts and features that will help you depict this subject properly. Please don't wait for inspiration to come visiting you, be motivated to learn and make yourself draw anything and everything that appeals to you. In my opinion, that is the trick to becoming good at drawing. Long ago, people believed that fairy rings of mushrooms were formed by footprints left by fairies dancing at night. The mushrooms were said to be the seats for the tired fairies. I don't mean to spoil the fantasy of legends but, in actual fact, the fairy ring develops because the roots grow outward from the center of the ring and they then form an expanding circle. 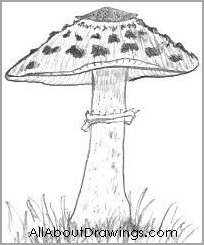 This is one example of my very first mushroom drawings that I did when I started building this site and that's a few years ago now. It used to reside on my home page. Isn't it great to look back and compare progress? This is a field mushroom. I remember when we were kids, my sister and I used to cook these on a homemade outdoor barbeque that we built using a couple of bricks with a grill sitting on top. We would always first ask Mum if they were safe to eat and after inspection, Mum would put a little dollop of butter on each mushroom for us. To this day, they still rank as one of my favorite foods so back then our cooking skills must have been pretty good! In real life, I have never seen a parasol mushroom which is illustrated here. According to reference books, it is egg-shaped at first with a double white ring between the cap and stem. As the fungus grows, the cap opens and looks bell-shaped. The cap is a dirty white covered with large shaggy brown scales and its flesh is white. Once it's opened, the drawing shows that it resembles a parasol and hence the name given to them. I am really enjoying this artistic journey. Please join me in making a positive change in your life. Give yourself an easy start by copying these basic images because focusing on simple outlines is the best way to learn how to draw a mushroom. 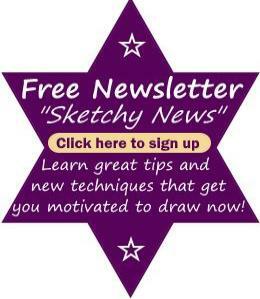 Your drawing skills improve with every sketch you create, don't put it off any longer, give it a try today. You can make the same discoveries as me because as I continue to practice these mushroom drawings, I sense there is a gradual improvement which is pretty exciting.